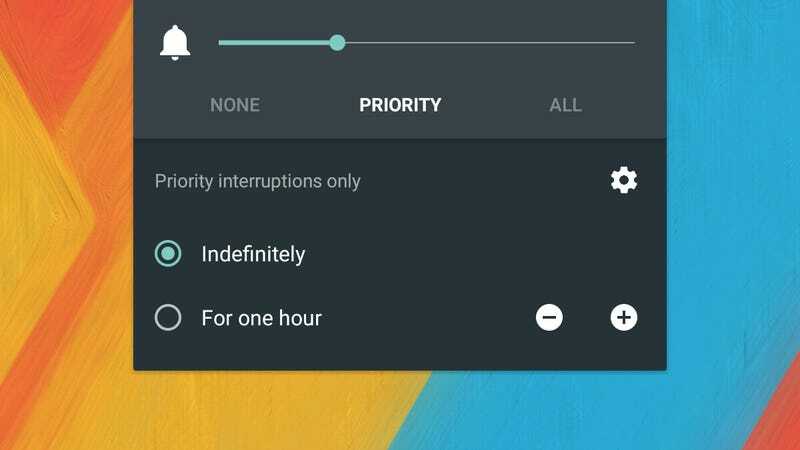 Among the features rolled out by Google in Android 5.0 Lollipop was a new Priority Mode that lets you set 'do not disturb' times, times when only the most important apps and people can get in touch with you. It can come in useful in meetings, on dates, and when you're asleep. We'll show you how to set it up to ensure you won't get woken up until the morning. The beauty of Priority Mode in Lollipop is that you can set specific apps or contacts that are allowed to interrupt your slumber (you probably still want to be available in case of emergency). In many ways it replaces the silent mode that's now mysteriously disappeared from Android (bring it back please Google!) though it offers a more customizable set of options. It's important to note that Priority Mode only affects the sounds made by your smartphone. Messages and calls will still appear in the notification drawer as normal, but you won't get any audio alerts. It's not the same as just putting your mobile into airplane mode (another alternative if you want a good night's sleep). A star icon is shown in the status bar when you're in Priority Mode. The easiest way to activate Priority Mode is actually via the volume buttons. Start moving the volume up or down (when there's no music playing) and then tap Priority on the pop-up dialog that appears. You can then choose whether to leave Priority Mode on indefinitely (until you switch it off, in other words) or have it run for an hour. Tap the plus or minus buttons if you want to extend or reduce this time period (you can choose from 15 minutes up to 8 hours). If you don't want to set Priority Mode manually then you can schedule it. Tap the cog icon on the pop-up dialog or head to Settings, Sound & notification and Interruptions. At the bottom of the screen, select the Days option and pick the days of the week you want Priority Mode to enable itself; you can also set the times accordingly, so when you go to bed and when you wake up would be a sensible choice. That's how to get Priority Mode on, but you can also set which events, apps and contacts are allowed to break through the wall of silence you've built. If you look at the Interruptions screen we've just mentioned, events and reminders (from your calendar), calls and messages can all be enabled or disabled. Note that any alarms you've set will always override Priority Mode settings, which is helpful if you want to be able to wake up in the morning. When it comes to calls and messages, the default is to let through communications from anyone. Tap the Calls/messages from link and you can restrict this to just the people in your contacts list or only the contacts you've starred. If you choose the latter option, you can head over to the Contacts app to get starring. This 'VIP' list of people will then be the only group that can make your phone ring or chime in Priority Mode. Individual apps can be configured too, should you want to allow WhatsApp but not Snapchat to rudely interrupt your sleep. From the Sound & notification screen, choose App notifications and then pick the app you want to allow through the Priority Mode blockade. Tap the option marked Priority and your app of choice then has the right security clearance. You might want to double-check the notification settings inside the app as well to ensure they're correctly configured. As with calls and messages, notifications from apps that you haven't cleared are still shown on screen as normal, but the audio alerts are disabled. You can also set your phone to show no interruptions at all from either the pop-up volume dialog or the Interruptions screen (tap the top option); this will block sounds from everything, even your alarms, so use with caution. It's effectively silent mode under another name. Priority Mode is best used for making sure you can only be reached in emergencies. If you don't want to be interrupted at all (in a meeting, say) then knocking the volume level right down to vibrate, using the no interruptions mode we just mentioned, or indeed switching your phone off completely is probably a better way to go.